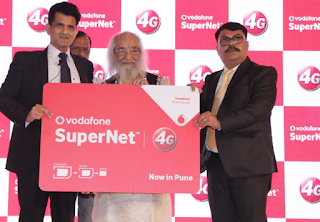 Pune: Vodafone India, one of India’s leading telecommunication services providers, today announced the launch of its Vodafone SuperNetTM 4G service in Pune. Vodafone SuperNetTM4G services have now been rolled out in 107 cities and towns in Maharashtra & Goa including Nagpur, Nashik, Vasai, Akola, Chandrapur, Amravati, Latur, Dhule, Malegaon, Goa, Ahmednagar, Nanded, Sangli, Miraj, Kolhapur, Jalgaon etc. and will soon be rolled out across all major towns and cities of Maharashtra by March 2017. Vodafone SuperNetTM 4G service is built on a strong fibre backhaul, a new and modern network. With this launch, Vodafone is now uniquely positioned to offer in Pune, 2G/3G/4G services on its own state of the art, convergent radio technology. Leveraging its global network and experience, Vodafone also pioneered international roaming on 4G for its India customers visiting in 20 countries including UK, Netherlands, Mauritius, Singapore, Czech Republic, Romania, UAE, Albania, Turkey, Germany, Sri Lanka, Canada, Ireland, Saudi Arabia, Morocco, Australia, Italy, Belgium, Norway, Switzerland with many more countries to be launched in the near future. The Vodafone SuperNetTM 4G launch in Pune follows the successful rollout of services in Kerala, Karnataka, Kolkata, Delhi & NCR, Mumbai, Haryana, UP East, Gujarat, West Bengal, Rajasthan, Maharashtra, Goa, Odisha, Tamil Nadu, UP West, A&NE and Punjab. Vodafone SuperNetTM 4G coverage will be available in 2400 towns across the country by March 2017. These 17 circles where Vodafone offers 4G service contribute over 90 percent of Vodafone India’s data revenues. The Maharashtra & Goa circle is a focus and significant growth market for Vodafone India. To cater to the growing volumes of customer usage and their increasing need for speed, the company has invested INR 10,880+ crore till date including INR 248 crore in H1 FY17 to expand, modernize and build a more technology and energy efficient network. Vodafone has a large retail footprint with 940 Vodafone branded stores spread across prominent localities in the circle, making it convenient for customers to access Vodafone’s products and services within their neighbourhood. Globally, Vodafone is one of the world’s largest telecommunications companies and provides a range of services including voice, messaging, data and fixed communications. Vodafone has mobile operations in 26 countries, partners with mobile networks in 49 more, and has fixed broadband operations in 17 markets. As of 31st December 2016, Vodafone had 470 million mobile customers and 14.3 million fixed broadband customers.